I've had long hair up until I was 7 years old, then my mother decided to give me a really short haircut (she took me to a hairdresser, but still). I have naturally wavy/frizzy hair, so just image how I must have looked like in the early 90s. It was a pain to grow long again. Then in my early 20s I used to have hair extensions glued in. I also blow dried it at the hairdresser religiously every week. Add this to my monthly hair dye, and you can correctly assume how the state of my hair was. I had to cut it/trim it regularly. About 2 years ago now I cut off my back layers, so my hair is now one length. Doing this has made my hair stronger than it was before. I then re-started the painful process of growing it again. 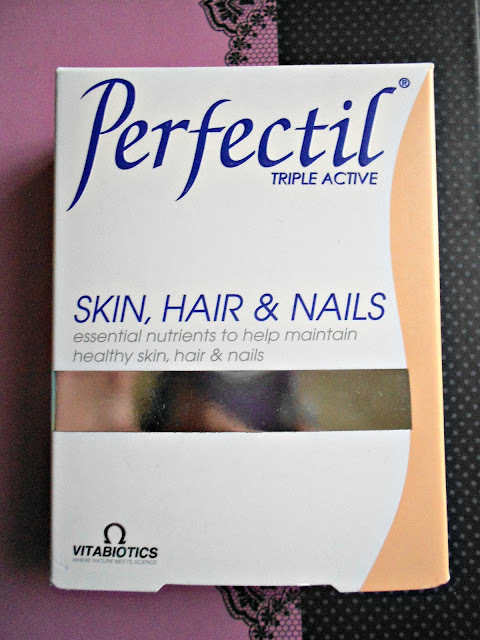 A couple of months ago I bought Perfectil vitamins to give my hair the boost it needed. They are vitamins to help maintain healthy skin, hair and nails. "Perfectil contains essential nutrients, specially formulated for utilisation by the lower dermal layer of the skin, and hair follicles. The nail bed also requires a regular supply of nutrients for growth. 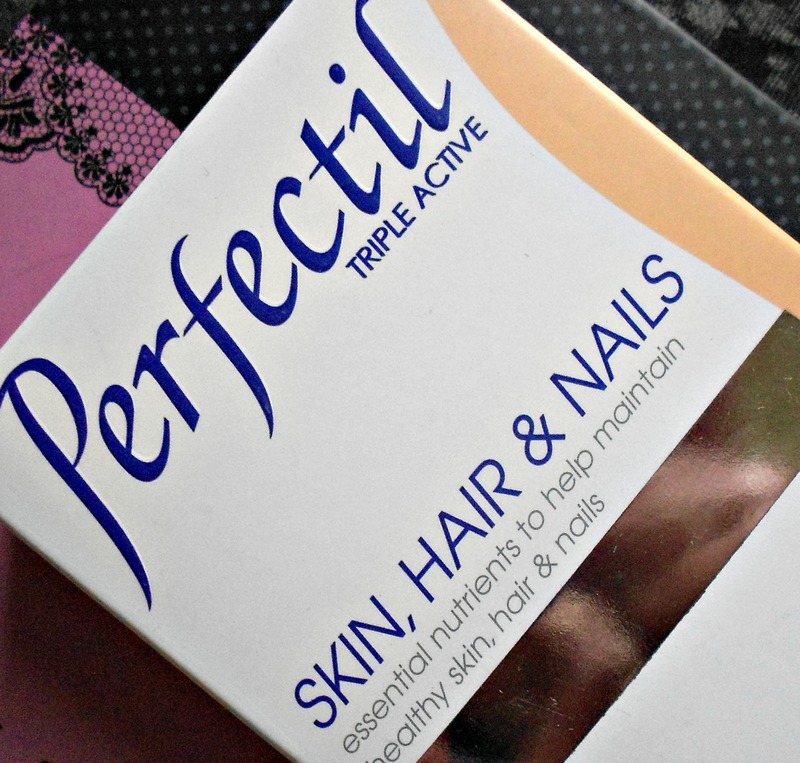 Take Perfectil because you new skin, hair & nails are really nourished from the inside." I used to take one of these everyday after lunch. 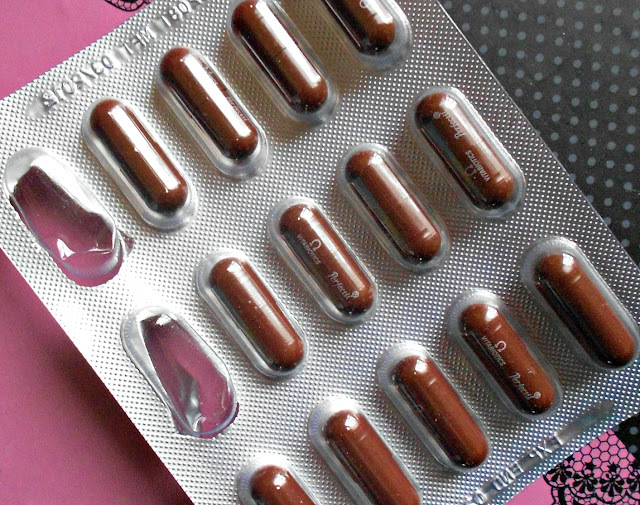 At first, I used to take them with my dinner but they gave me stomach ache, but if you take them with a large meal and early in the evening you should be ok. I normally have dinner between 9-10pm so most probably that's the reason why they gave me stomach ache. I've seen a noticeable difference from the moment I've started taking them. My hair has never been as long as it is at the moment and my nails are stronger than before (I notice this when I take off my nail extensions). 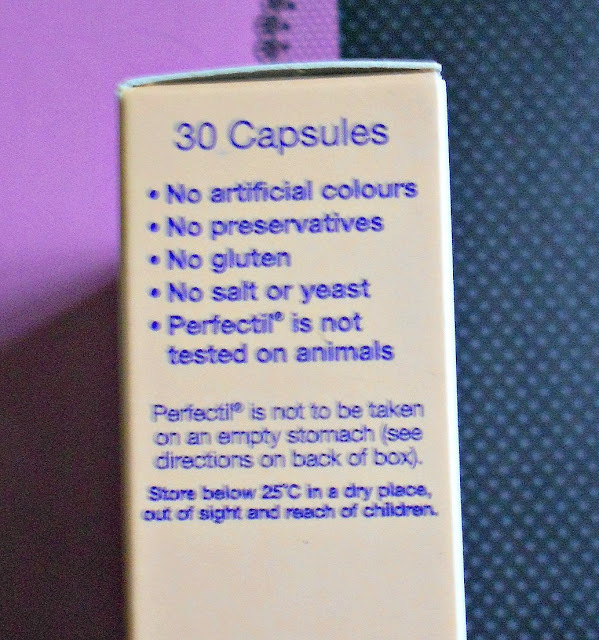 They don't contain: artificial colours, preservatives, gluten, salt or yeast, and it is not tested on animals. I bought mine over the counter for Euro 9.50 (there's no need for a prescription). I'm not saying that your hair will miraculously grow longer overnight, but I saw a difference in mine. Always check with your doctor or pharmacist before taking any pills/medication. Hi :) Yes you definitely should! Yesterday I also bought Lee Stafford's Hair Growth treatment, will see how it works and post about it in a month or so. I was thinking of giving these a go and now I think I'm sold! Thanks for the review! I've been looking for this review. I am glad I come across in your blog by accident. You totally just sold me on this review. I am planning to make a blog about mandelmel and want to share it with you. Hi i just wanted to say that i came across your review a couple of weeks and decided i would try this product out myself. My hair was in a state after a hairdresser went over the top and hacked my hair short. Now after 16 days of taking them my hair is looking much healthier and also looks like its been growing. Whether this is due to the product or because ive also been using the Lee Stafford hair growth range too. Whatever it is, i shall continue to use both and hopefully il get the long glossy locks back again!! Yey! I am happy that your hair is growing long again :D I also use the Lee Strafford hair growth range - albeit just the treatment and about once every two weeks. But I do think that Perfectil work wonders. Thanks for letting me know that you found my review helpful! Hi did this make fat for body??? Personally it did not (not that I know of) but I think it depends on the person. Hi Evie, I have never tried the tablets so I really cannot say. Herbscity provides a combination of nutrients, including Vitamin C and Biotin, that support the structural foundation ofyour Natrol Skin Hair Nails. I take these after lunch and i get a really bad stomach ache. I also tired eating more than i usually do for lunch so that i may be more full before i take the tablet; but the results is still the same. Once i take the tablet i get soo much pain. Idk what to do. guess i should stop taking them. do the hair grows all over the entire body ?? Yes, it is one of the problems, ha! I see lots of product but one of my favorite product is hair jelly. you will get best result in few days . 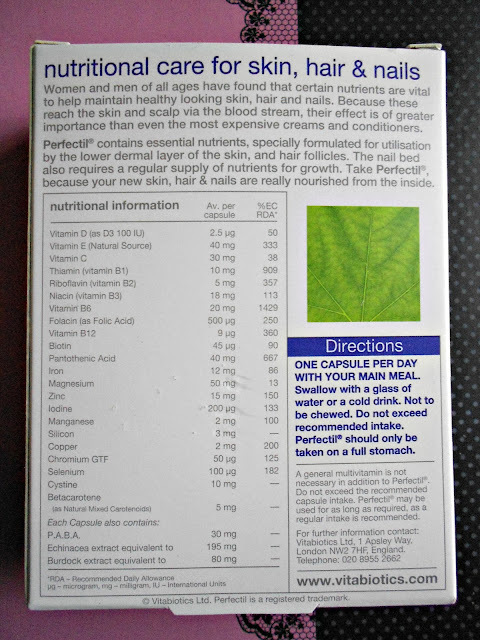 . .
• Promotes nutritional support for hair, skin, nails; Helps maintain strength & hair skin nails it works. • Produced in USA in state-of-the-art, GMP certified manufacturing plant; Superior quality control. lots of people using this product i like your work out . keep sharing this type of helping post . Wigs Alberta experts will be happy to assist you with making the right color choices by renting you a color ring or you can send us a sample of your hair and we will match it for you! Please take a moment to shop for a top piece today, the best and fastest solution to thinning hair on the top of your head. Skin whitening creams or products lighten your skin tone only to one shade but first time in the history you would be able to use Natural Glow Skin Whitening Supplement that promise you to grab 1-3 shade lighter skin tone only in 3 months. If you continue usage then you can also expect 3-6 shade lighter skin tone. Voila! No natural product can offer you this “Whitening gift pack”. We have the Best Ways to Stop Hair Loss Naturally. Try our British vitamins brand packed with Zinc, Biotin, Copper, Selenium, Folic Acid, Iron and other nutrients to effectively treat your hair fall problem. References - Paul, B., 2018. Fenugreek Testosterone Studies: Benefits, Dosage & Side Effects Guide! [WWW Document]. Testosteroneofficial.com ie. Testosterone Official. URL https://testosteroneofficial.com/research/fenugreek/ (accessed 10.31.18). I enjoyed reading your blog. This is pretty cool. I also have blog where i Post Beauty Hacks TipsThat You Must Know Visit my blog and get multiple deals & discounts with alive skin + hair Promo Code.